As we near the end of the year, I have a question to ask you: Are you one of the millions of people who begin thinking of setting goals and resolutions for the new year ahead? If you are, some of you will start the process by bringing up the disappointments of this past year (not a very motivating way to start). It goes something like this: I should lose weight, should get that job/raise, must be a better parent/partner/spouse, must be…Oh boy, the list of musts and shoulds! Most of these well-intentioned resolutions and goals lay dormant after the first of February–that is, until the list is dragged out, regurgitated, and begun anew in a fresh burst of hope this time next year. Gosh darn it–THIS will be the year you (fill in the blank)________________! And so it begins again. Some goals may be achieved, but more are scrapped and lay on the proverbial cutting-room floor. It was too gosh, darn hard to achieve them. You’ve lost interest, focus, your mojo, motivation, etc. 1. Ditch the shoulds…you should be neater, more organized, skinnier, a better this, a better that…You can leave perfection behind with 2014. You’re good enough–let’s start with that premise. This isn’t about perfection, it’s about action. Inspired action. 2. AND…let’s make it a nice environment and fun to do this exercise. Put on some nice music, light some candles–make the environment cozy, comforting, and nice for yourself. Start equating this dreaming session as a nurturing time to work on you–because you’re so worth it! You go into a spa to get physically pampered–and the pampering to your soul and mind are byproducts of that relaxation. For this exercise, you’re working on a mind exercise, but engage your body’s senses (smell, sound, sight) and touch your soul by creating an inspirational environment and atmosphere. What if you looked at New Year’s from a different perspective? Ready for an upgrade? What’s your mantra or intention for the year? What predominant feeling do you want to experience this year: peace, happiness, harmony, confidence? How can you bring more of this into your life? Do any of your goals/resolutions have a common theme? To be more organized? Simplify? What is the feeling you’ll get after these goals have been accomplished? That’s what you’re after, isn’t it–when all is said and done? The happiness, peacefulness, joyfulness, love? You can experience those feelings right now by finding activities and/or thoughts right now that bring them up for you. What kind of memories do you want to create this year? How do you want to wake up each morning? Make a list of your values. Incorporate your values into the overall vision of your life. Visualize your goals–don’t just write them down. 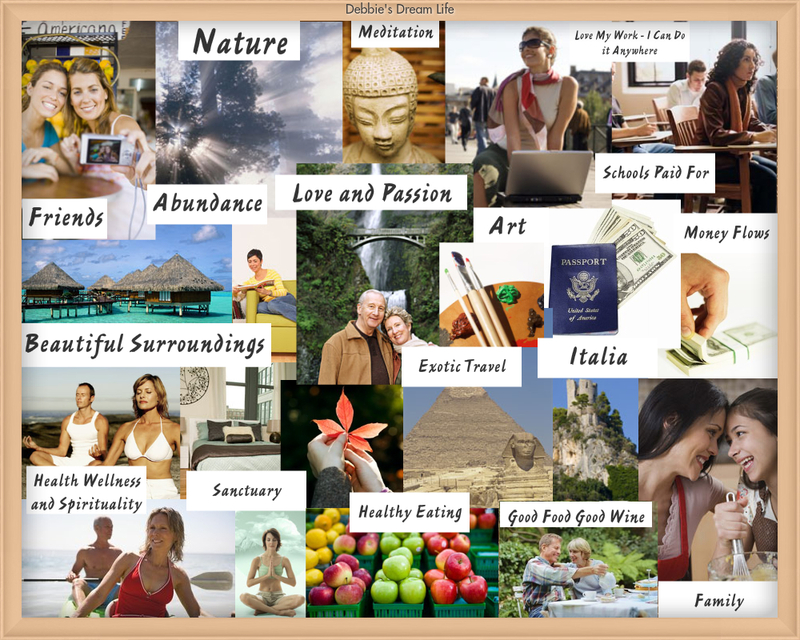 Find pictures that represent them and create a vision board. If you have one already, assess if you need to update it. Besides the vision board, visualize yourself already reaching your goal. Visualize in detail what this might look like, feel like, and be like. Use technology to help you with reminding you of your goals. Check out apps like Evernote that you can integrate with your computer, iPad, and phone. Make goals for every area of your life. 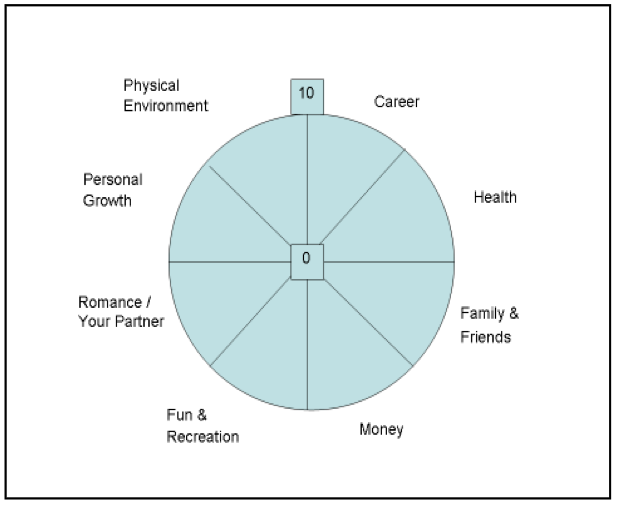 Use the Wheel of Life to get you started.